The organization said it was not worried that the problem's answer might be spread around the internet. Anyone who breaks the code will be invited to apply for a job. Following this, the government announced last week that it would set up a specialist department within GCHQ. The Joint Cyber Unit will concentrate on tackling the growing threat of cyber attacks from organized criminals, terrorists, hostile states and hacktivists. GCHQ claimed that this was the first time this sort of challenge had ever been conducted by an organization to target these sorts of skills. Here is a code. 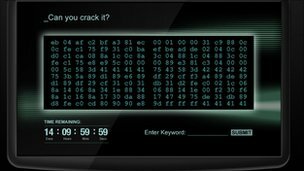 Can you crack the code?